As an Asian American and the longtime writer of a column called “Amok,” I felt a strong spiritual obligation to be at the inaugural celebration of Fred T. Korematsu Day held last Sunday, Jan. 30, in Berkeley. Now here’s a guy who went amok in the most metaphorical sense of the word. Sunday would have been the late Korematsu’s 92nd birthday. It was also the first time ever an Asian American has been honored with his own official day, at least in California. It should be a national day. Korematsu isn’t just a hero for Asian Americans. He’s a hero for all Americans, to echo the sentiments of the event’s keynote speaker, the Rev. Jesse Jackson. Indeed, Korematsu is no less an American civil rights figure than Rosa Parks or Dr. Martin Luther King, Jr. or Jackson himself. 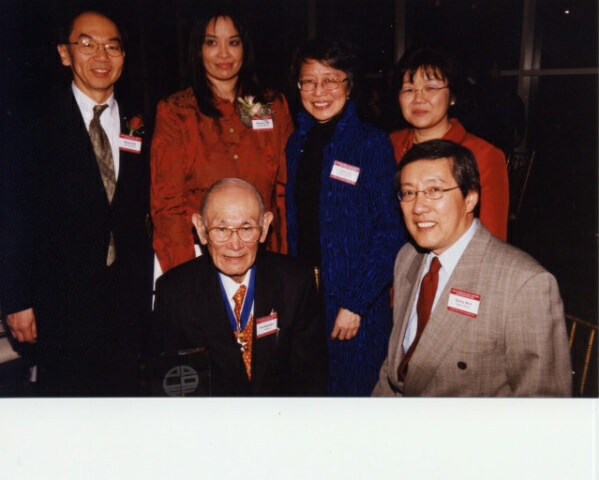 Fred Korematsu, 2002 AALDEF Justice in Action Award recipient, with board and staff at lunar new year celebration in NYC. Photo by Corky Lee. But you know those folks. Fred T. Korematsu? FTK? Korematsu was the man who in 1942, when he was all of 23, refused the U.S. government’s order to be placed in an internment camp for Japanese Americans. Everyone else was rounded up and incarcerated without a fight. The U.S. said, go. Korematsu said, no. Last weekend’s event featured a screening of the award-winning documentary, Of Civil Wrongs and Rights: The Fred Korematsu Story. In the film, Korematsu explained how he was on a date with a Caucasian woman at the time of the Pearl Harbor bombing. He saw himself as an American and didn’t think his country would do anything to him just because of the war. But soon after, he saw how the world changed its view of anything remotely Japanese, and how his government now regarded him as being the same race as the enemy. Korematsu defied the internment order for awhile, even underwent plastic surgery to see if that would allow him to look more Caucasian. It didn’t. His ultimate arrest was fodder for a sensationalistic mainstream media, which at the time spiked its copy liberally with the slur “Jap” to describe both Asians and Americans. It was the news coverage of Korematsu’s jailing that caught the eye of the Northern California ACLU’s executive director Ernest Besig, who decided to make Korematsu the test for the constitutionality of the internment. Korematsu did ultimately spend time in an internment camp. He found that not only was he shunned by general society and his country at war, he was also shunned by other Japanese Americans in camp who believed he should have shut up and cooperated. Vindication would take about 40 years. In 1983, Prof. Peter Irons, a legal historian, discovered government memos that were kept from the Supreme Court in 1944. The documents revealed an internal struggle within the government on how to present the case. Would it go with the the Army’s contention that Japanese Americans were a threat to national security? Or would it also present information from the FBI and other military intelligence that contradicted the Army? The suppressed information was enough for a group of attorneys, mostly young Japanese Americans, to re-open the case and overturn Korematsu’s conviction in 1983 in a federal district court in San Francisco. When is a victory not quite a victory? The Greek King Pyrrhus had his victory, and so did Korematsu, as the 1944 Supreme Court decision remained untouched. The government declined to appeal, leaving Korematsu’s crew of young lawyers unable to go back to the high court. But is that enough? Minami told me it would be ignorant for anyone to use Korematsu as a precedent today for the wholesale imprisonment of people because of their race. But when you think about post-9-11 incarcerations of Muslims at immigration holding cells in New York to Guantanamo, it’s not far-fetched to see how a xenophobic zealot without a knowledge of history could easily misread Korematsu, even after the conviction was overturned. Too often ignorance is king when the politics is hot. That’s why Korematsu’s family has started the Fred T. Korematsu Institute to use history as an educational tool to combat any misunderstanding now or in the future. The Supreme Court case may remain unfinished business. But it forces us to keep Korematsu’s memory alive and make his lifelong fight our perpetual battle for civil rights.